a luxuriously oversized scarf in a neutral color ranks near the top of my foundation pieces. it's a simple garment – just a large rectangle of fabric, technically – yet there are a number of small details that really distinguishes a fantastic scarf from a mediocre one. the lambswool should be soft and substantial, but not itchy. the scarf should be windproof, cozy enough for running around the city, and wide enough to double as a shawl for cold offices and chilly inflight naps. there should be a sculptural quality in how it drapes: enough balance in loft and weight to hold its own structure. i love mine in grey so much that i'm considering getting another one in camel. (one can never have too many scarves, i say!) some of Acne's designs can be rather difficult to wear, but in terms of style and function, this scarf is quite a universally gift-able option. what do you think? what are you wearing today? I really love this scarf and have also been thinking about getting it. 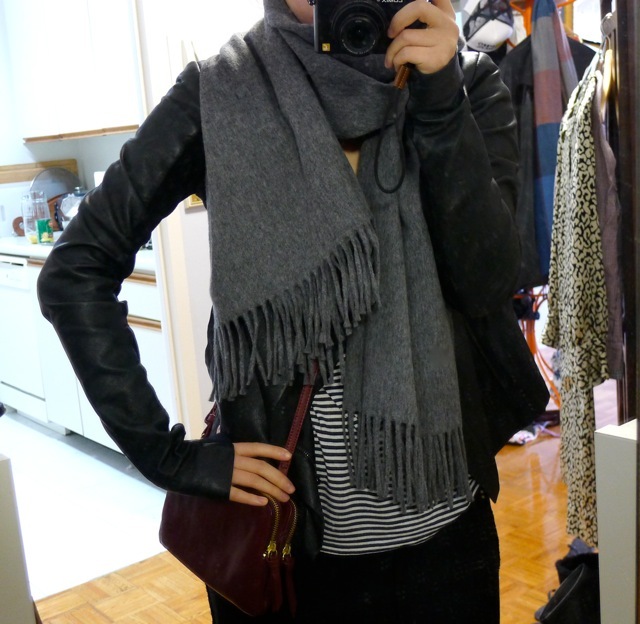 I get a lot of wear out of my Isabel Marant scarves, but would really like to throw a rectangular scarf into the mix. me too! the acne one is definitely warmer and cozier though. Oh - a fabulous scarf. In fabulous grey. I'm surprised to learn it's rectangular which I would imagine could be a little tricky to wrap around? I have a tartan one which is oversized but almost too thick to make it useful which is such a shame as it's such a lovely colour. I love the whole look and that there is a skirt involved instead of the usual jeans - it makes the outfit more dressed somehow. Lovely - especially with the Steven Alan bag. thanks! this one wraps around quite nicely - thanks to how wide it is! I have that exact same scarf in the same color and am wearing it as I type. It's my absolute favorite! I love it so much that I'm going to get it in wine red as well. You look great - love the whole look! I have a lovely rectangular wool scarf in an ombre blue--ranges from a mid-level blue to midnight blue color--bought on deep discount from the now-defunct Martin & Osa that fulfills the same niche for me. It works as a non-neutral neutral, and breaks up my usual monochrome outfits. that sounds lovely - and blue is definitely a very special neutral. Great scarf! I have a small collection of scarves in varying fabrics & weights. I see you also have the spotted cat dress from j crew! ha! great eye - yes, i'm thinking of getting it shortened to a blouse by my tailor. will do a post on that if i go through with it! I love love your foundations series -- I've already said this, but I wanted to say it again! I've been looking for the perfect scarf for a while, but with no serious intent. I too want a rectangular scarf, wide enough to cover the shoulders but also long enough to properly wrap around my neck. The skin on my neck area is rather sensitive so I really do have to test out materials before buying anything, so far no luck in finding something soft and comfortable locally. Zara currently has a scarf that fits that description but it isn't available in the perfect shade of heather grey. Loving that combination of black, grey and burgundy in your outfit! So luxe! You may have just given me an idea for my Christmas wishlist. :) I love the whole outfit, actually—that skirt, especially! I can't live without my scarves. Today I am wearing a huge Indian wool scarf. Ivory and grey with a little beading. Glamorous and warm! I seem to be hearing a lot of good things about that acne scarf, and while going into warmer months, I can't help but feel inclined to pick one up. I'm currently using a "pashmina" as a scarf, but need to look into investing in a luxurious woolen one. I love your maxi skirt! H&M had a great one with their Grey Concept collection, but seeing as I'm well above average height I just couldn't buy it. They can't be that hard to sew though, right? Love it! Beautiful colour and the material looks gorgeous. I have this chunky ribbed cashmere scarf that I wear all the time, and I have it in black as well. I find that adding a scarf often solves the 'there's something missing in this outfit...' problem for me. This is probably why I prefer colder weather, because scarves and jackets make my outfits look better! You look great, especially in that skirt. I have two large scarves. One hot pink cashmere from Loro Piana, one scenic cashmere voile from Eric Bompard. They are rather spectacular, if I say so myself:). I posted the Bompard on my blog just recently. Yes!!! I searched for one for years and years and years and years and then I found my perfect one too, it was by an Australian accessories label called Benah, and it was so long you could wrap it around 3 times and it was cashmere!!! It's been a lifesaver in winters in australia and overseas, and when they reissued it this year in a travel wrap style - perfect as a little blanket shawl! I snapped one up too... When you find perfection you have to lock it down, you know (get the beige). Looks cozy! Acne surprises me with how many low-key simple things they make, in contrast to all the things they show on their runways. I just love how you put the outfit together. Love black leather jackets! For a long while, I was obsessed with Hermes shawls. Shockingly expensive so I've been looking elsewhere since. I'll still keep mine because they're absolutely works of art but I wouldn't mind a simple plain version like the one you've got. hermes shawls are gorge. i hope H gets to keep making their wondrous creations - one of the few great luxury houses that still lives up to its name! You look so chic! I love your skir- it's so Rick Owens! Scarves make such lovely gifts. I've been wearing all types of scarves and shawls this autumn. thanks Lindsay! the JP black maxi skirt is definitely an easy elegant piece. That is such a gorgeous scarf. I love scarves, I have some by Chan Lu in a cashmere and silk blend, but they are not as structured as this one by Acne. Your scarf is somewhat similar to my Loro Piana Scarf. I am amazed how can our choices be so similar? Like minds think alike, I must say. This look is absolutely amazing! Now I have to get a long, black skirt! Where did you buy that jacket? I had the same scarf in black and burgundy , but have lost both of them... Such a shame, I really miss them !!! and after seeing you here, I kinda also need the grey one! !